This is my first TFL write up. 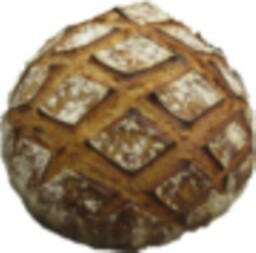 While I have only made some comments on posts within the last couple of months, I have been stalking the wonderful forums and submissions on this site since I started baking bread regularly, about four years ago. I think a big thank you to the collective of the website is in order, if not something more. This particular bread was born out of frustration: I tried a 100% whole wheat miche about a week ago (all whole wheat, except for a rye starter) and it failed pretty miserably. I know why it failed. My apartment is cold (around 62 F), especially since it is a NYC basement apartment, and I wanted things to go much more quickly than they needed to. So, the loaf was under proofed and also, as I found out when I cut into it the next day, under baked. Out of shame, there are no pictures. So, the next day I tried to redeem myself but ended up repeating many of the same mistakes. I again tried to rush things and was again disappointed. For this loaf, however, I made two modifications: 15g of toasted wheat germ in the final dough, and instead of going for 100% whole wheat (again, aside from the rye starter) I added 100g white bread flour. This made the final dough a little more forgiving, and this loaf I was willing to eat. However, with the high hydration of the dough (around 82%) and an under-floured banneton, the dough stuck when I unmolded it and this shows on the final loaf. So again, no photos. The following was my attempt to redeem myself. I had just gotten back from a research trip in France and since I could still taste the bread the sting of frustration was all the more harsh. Covered and left alone at room temp for 24 hours. This day the kitchen temp hovered around a whopping 15C / 59F. The bulk ferment lasted 5 hours with three-part folds at 1.5 and 3 hours. 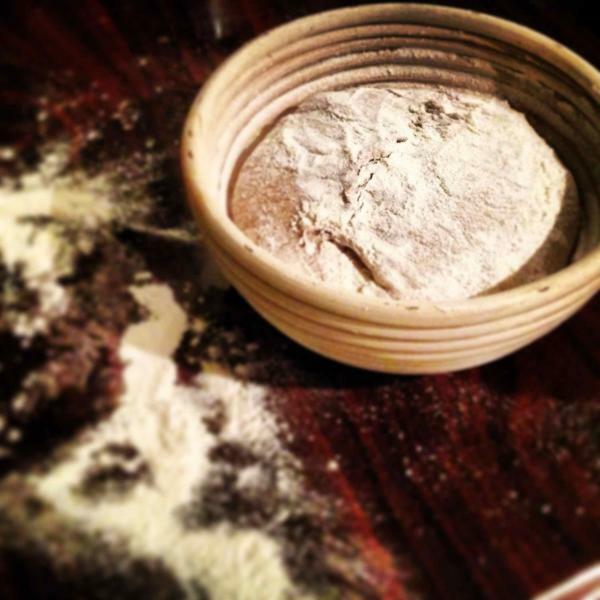 After 5 hours, I turned the dough out and pre-shaped the dough for a boule and let the dough rest for 20 minutes. I then shaped the boule, plopped it into a banneton—well-floured this time, mind you—and parked it in the fridge for 16 hours. The next day I took it out of the fridge and let it come to room temperature (again, around 15C) for two hours on top of the oven, which was heating breakfast and then preheating for the bake. I baked the loaf in my preheated cast iron skillet at 500F with steam for the first 20 minutes and then at 450F with no steam for another 25 minutes. At the end of the bake the loaf’s internal temperature reached 214F. I then left the bread in the oven for 1 hour after I killed the gas. Oven spring was good, though not as even as I would have liked: again, a part of the dough stuck in the banneton. This banneton is newer, so this tendency to stick might decrease with use. I also might just outfit it with a linen liner. Sounds like you are having fun with your baking and learning as you go. Final test is in the flavor. As one poster here says 'flavor rules'. My kids liked my under-baked loaves! 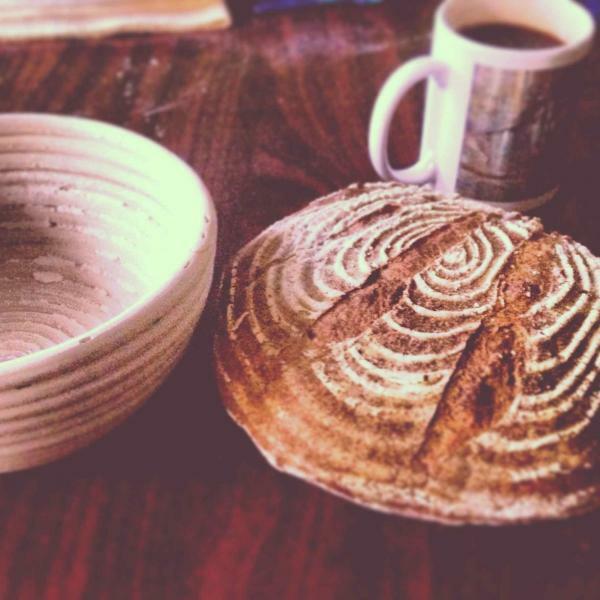 In fact, they still ask me to bake some of the breads I used to make when I first started baking. Only now I can't remember how I made them because they were 'mistakes' - under proofed or under baked or burned...the list goes on and on....I can hardly bear the sad looks on their faces when I can't reproduce one of those loaves. People always encouraged me by saying anything home baked is better than store bought so I soon got over my discouragement about loaves not turning out as expected. Thanks for the lamp tip. Until I move into a new, bigger apartment, I'm afraid my girlfriend has banned me from making or purchasing any new large appliances--so I don't think I'll be making a proofing box anytime soon. The flavor is pretty darn good. Definitely good enough for peanut butter sandwiches. And it was definitely good griddled with sharp white cheddar and dijon. I think your bread's crumb is beautiful! 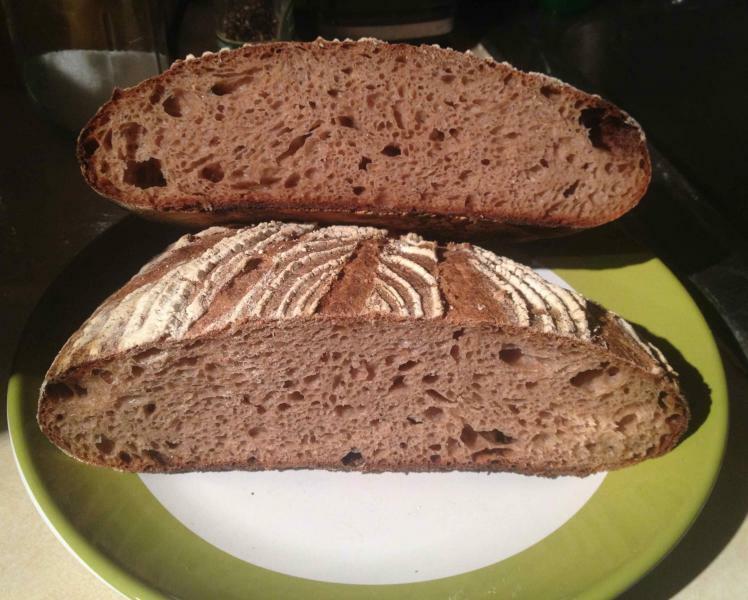 I like how you put the toasted wheat germ in the levain - bet this bread tasted wonderful. Thanks for the comment on my crumb! Coming from you--after being amazed by your photos' crumbs for years now--it's an honor! Thank you so much, Scott, what a kind thing to say! WW bread a lot. Nicely baked for such high hydration in a brotform. As Janet Mentioned before, with hydration this high, rice flour will make your unmolding risk free. I also go with what Mini Oven told me about high hydration. 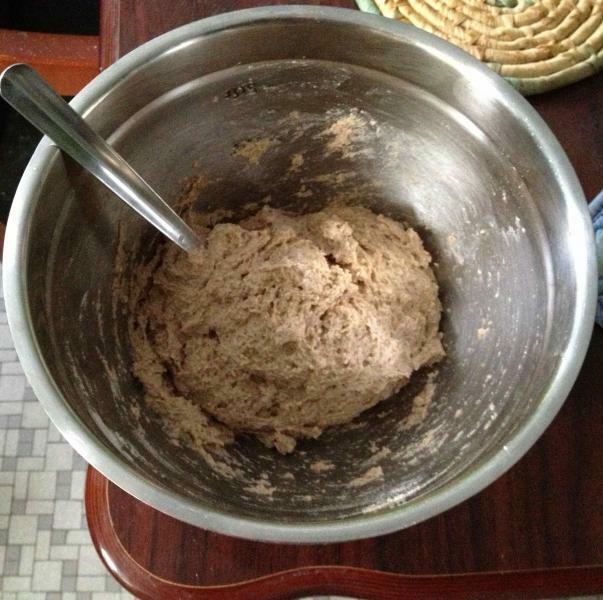 Dough over 80% needs to be in tins after I had so many spreaders :-)Yours don't spread as much as mine did though. I have my dough and levains on a heating pad set on low. I control the temperature with how many folded kitchen towels I have on top of the pad and under the dough. Then I cover the dough with another unfolded towel. Right now it is two towels under and the temp holds at 84 F. This is a little high for most breads but the panettone needs it.